Each plate has the design of a single chrysanthemum (kiku) shifted towards the left side of the plate … but they were carved in a way that each has a life of its own. None of them look the same. The design is sharply cut into thick layers of black urushi lacquer – tsuikoku. It is known to be a difficult job – this later lead to Kamakura bori(carving) which is a technique of lacquering on carved wood. The plates are very light. It indicates a high quality, matured wood inside. The edges of some plates are rough but not as bad as shown in the photo. 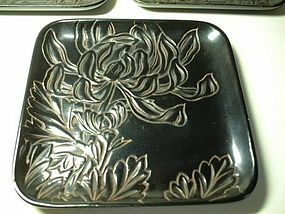 The layers in urushi lacquer does not show since they were painted with the same black color. Around Taisho period. 5 7/8" square.